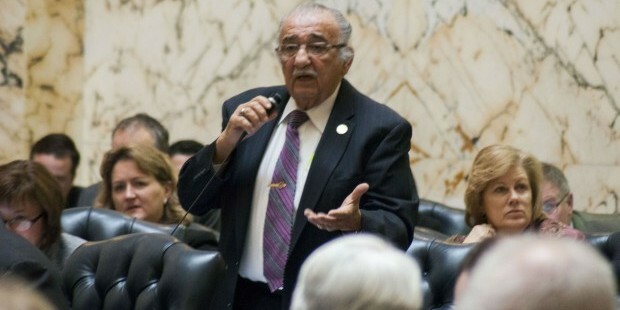 The House of Delegates ultimately passed a bill to change requirements for police property seizures, with fierce debate about whether the bill was helping “the small people” of Maryland, or handing drug dealers another tool in their belt. HB 360, sponsored by Del. Joseph Vallario, chair of the House Judiciary Committee, passed with 81-54. Six Democrats joined all of the House Republicans in opposing the bill. Vallario said the main argument for this bill is that because police are able to seize personal property associated with drug or gambling crimes without a high burden of proof, it gives the owner the responsibility to prove their property was not involved in criminal activities. However, it has become increasingly difficult for people to receive a court hearing in order to fight to get their property back. “I’m all about giving people the right to be heard,” Vallario said. Under the “equitable sharing program,” law enforcement officers are able to send seized property to the federal court. Then local departments can get a return of up to 80 percent of the asset’s value, with federal courts keeping 20 percent. The federal hearings are held out of state and citizens must bite the expense for a lawyer. “You have to go to Quantico, Virginia with a lawyer to contest that and very few people can afford that,” said Del. Curt Anderson, D-Baltimore City. The bill limit seizures sent to the federal government to the cases being prosecuted federally. It would also shift the burden of proof of criminal involvement of property from the owners to law enforcement. There was concern that most seizures are in fact drug deals and that by passing this bill, law enforcement would have extra work put into their hands. Del. Kathleen Dumais, D-Montgomery, explained that she has heard many stories over the years of average people stopped and their property seized, even though it was not drug related. “I don’t want anecdotal record, I want the facts,” said Del. William Folden, R-Frederick County. One anecdotal story told during session was recounted by Vallario. A Maryland liquor store had $3,000 seized from their in-store safe, after the store owner’s children were caught selling weed outside the store. The kids were charged with possession and intent to distribute while the parents lost the store’s revenue from sales that day. Del. John Cluster, R-Baltimore County was not deterred because police agencies said that when they review the case, they return money that is not drug related. Vallario said that the committee addressed concerns from law enforcement, by removing a 90-day cap on how long an item could be held before criminal charges are filed. That change was intended to help officers on long-term criminal investigations from having to blow their cover too early. Vallario believes the bill will pay for itself. Since only federal-drug cases will be sent to the federal government, local jurisdictions will be keeping the revenue percentage taken out when handled federally.